“Your blackness is amazing," Professor Mamokgethi Phakeng welcomes the Mastercard Foundation Scholars. 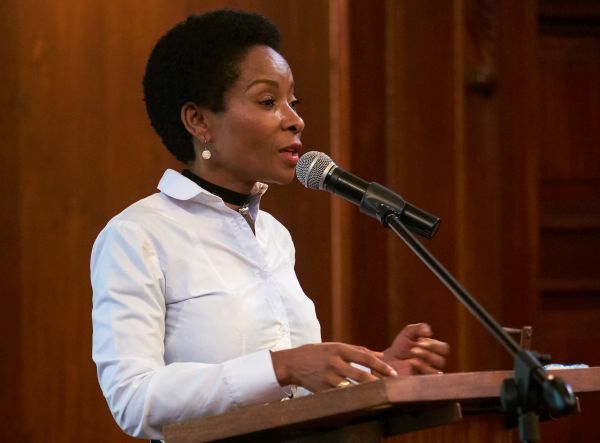 “Our differences, or what we perceive as flaws, are what set us apart,” Professor Mamokgethi Phakeng, UCT’s deputy vice-chancellor for research and internationalisation, who succeeds Dr Max Price as vice chancellor in July 2018, told the Mastercard Foundation Scholars at their welcome during April. This year, UCT welcomes 43 new Mastercard Foundation Scholars through its doors: nine undergraduates and 34 postgraduates. “The way you think – even though it’s different to the way other people think – your questions, your curiosities: they matter,” Phakeng said at the event. “Those different questions that you have, that nobody asks and that you think, but never ask. They make you stand out. Phakeng, who was speaking about black and African excellence, highlighted the importance of accepting yourself and loving who you are – as you are – and being your best for the benefit of yourself, as well as your communities and all other black and African people. Who is a Mastercard Foundation Scholar? The Mastercard Foundation Scholars Program is built upon the premise that all young people, no matter their starting point in life, should have the opportunity to obtain a quality education and pursue their aspirations. To this end, the program provides education and leadership development for tens of thousands of bright, young leaders who are overcoming hardships, and who share a deep personal commitment to changing the world around them and improving the lives of others. Dr Beata Mtyingizana, director of the International Academic Programmes Office, addresses the audience. In her welcome to the scholars, Dr Beata Mtyingizana, director of the International Academic Programmes Office, told them, “Mastercard said to me that you are the talented ones because you are the ones who are going to make a difference in your communities. You are the ones that are going to take hold of the leadership element that has been entrusted to you by Mastercard. Mastercard Foundation Scholars at UCT, who have been carefully selected, receive comprehensive scholarships, which include fees, accommodation, books and stipends. Through mentoring, leadership training, academic and life skills support, the scholars are equipped with the knowledge and competencies to contribute to economic growth and social development in their own countries and communities. A few of the Mastercard Foundation Scholars (from left to right): Danielle Goho, Takudzwanashe Mudzuri, Mixo Ngwenya, Carol Masingi, Thapelo Hlongwane, Asisipho Mnyanzeli. In her speech, Phakeng also explained the role of black excellence in raising the profile of black people. “It’s also about self-love, that we as black people – after many years of oppression and marginalisation – we can stand up and say, we do matter,” she explained. “That you don’t have to be something else to be beautiful, to be smart, to achieve great things.